Friday fun day was in effect and when the work bell rang, I slid down my dino’s tail, and headed for the movies. Although I enjoyed Chipotle, rather than a Brontosaurus burger, my tummy was happy none the less. So off we went to good ol’ AMC Barrywoods 24. As we walked up to purchase our ticket we were approached by a clean- cut All-American 14 year old boy who asked, “Any chance you guys are seeing 30 Minutes or Less.” To which my dad replied, “We are.” Prompting the young man to ask, “Could you be our fake father?” The answer was no and the kid said ok and walked away back to his group of friends. My dad and I applauded his efforts and we both agreed that we would much rather see him trying to get adults to buy him R rated movie tickets than standing outside a liquor store asking adults to buy him beer. Sorry little-shaver, the rules may have changed but the game is the same…I figured out how to sneak into R rated movies all on my own when I was your age, you can do the same. 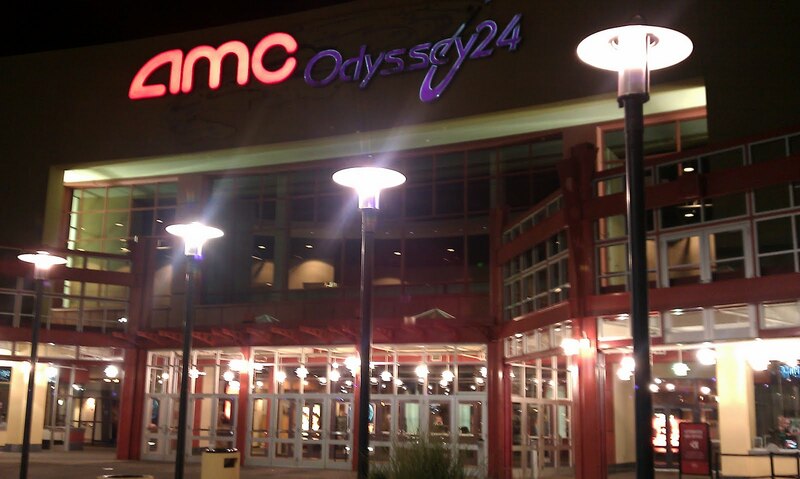 Since the flick was R rated and it was midnight I didn’t expect a big crowd. So I was surprised to see a half-full theater 15 minutes before show time. Not only was it half-full but there were 4, count ‘em, 4 beach balls being tossed around. People were yelling and laughing and having a grand old time. Then, as always, one person couldn’t handle themselves and hit one of the balls as hard as he could, with no loft, straight into another patron’s face. Naturally this prompted Beach Ball Face to leave the theater and return with one of KC’s Finest who gave a stern look around to all in the theater, promptly ending all beach ball shenanigans. 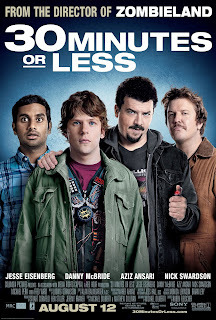 In the action-comedy 30 Minutes or Less, Nick (Jesse Eisenberg) is a small town pizza delivery guy whose mundane life collides with the big plans of two wanna-be criminal masterminds (Danny McBride and Nick Swardson). The volatile duo kidnaps Nick and forces him to rob a bank. With mere hours to pull off the impossible task, Nick enlists the help of his ex-best friend, Chet (Aziz Ansari). As the clock ticks, the two must deal with the police, hired assassins, flamethrowers, and their own tumultuous relationship.” The way in which the criminal dup force Nick to rob a bank is by strapping a bomb to his chest that will detonate in 10 hours if he fails his mission, attempts to take the bomb off, or contacts the police. This seemed like a funny premise, it had a good cast, and it had a pretty great trailer. On the surface this might look like an odd choice for Eisenberg fresh off the excellent drama The Social Network, but he is no stranger to the comedy/action genre; catching his big break in the new classic Zombieland. Here Eisenberg is again teamed up with Zombieland director Ruben Fleischer. For those Social Network fans who pay close attention there is a nice little facebook joke in 30 MOL poking fun at Eisenberg’s turn as Mark Zuckerberg…it’s easy to miss so pay attention. Eisenberg is fine in the role. It’s nothing new. He plays almost the same character he did in Zombieland. It’s a little disappointing given that we know he is capable of more, but this movie doesn’t require much more than the stoned slacker role. ...funny funny stuff. Aziz has some funny moments in 30 MOL and it’s nice to see him getting more feature roles. Ultimately this movie is a waste of potential, both of cast and premise. The writing just does not live up to how promising the premise is and how talented the cast is. There are some funny lines throughout, most of which you saw in the trailer, but no real gut busting moments. More so than the lack of laughs, this movie has major tone issues. There are some psychotically violent moments that are supposed to be funny, but come off as awkward, out of place, and, at times, downright uncomfortable. There are a lot of things wrong with this movie but perhaps the worst thing I can say about it is that it’s only 1:23 long and I felt like it dragged…a lot. I’d say it needed another round at the editing table but at 1:23 there’s nothing else to cut. I imagine the studio saw the dailies and knew they had a bad movie and were banking on star power and a good trailer to bring audiences in. And for the first week they will succeed in that endeavor, but I have to imagine word of mouth will start to hurt this one after opening weekend. I give it 2 out of 5 Helmets. All 3 stars are better and funnier in their other movies and television shows, so save your money and rewatch those. This movie could pass the time on an airplane or in a hotel, but I wouldn’t even waste space in your Netflix queue. Till next time, this is The Kid in the Helmet reporting for The Reel Rhino. Thanks Kid…as well spoken as any review I have ever read…you are a gentleman and a poet. Firstly, in short, I agree with almost every sentiment the Kid points out above. Aziz Ansari is hilarious. His adlibs were the highlight of this flick and the only reason I also give it a 2 of 5 Horn rating. Danny McBride is routinely entertaining, but it felt like he was meandering through the script, devoid of the passion we typically see from him. Nick Swardson is also enjoyable, most of the time, but he too seemed to underperform in every way here. 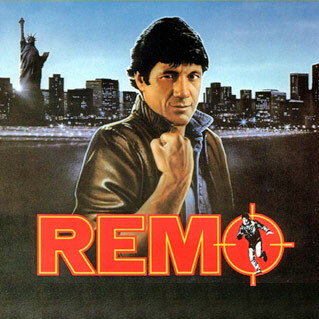 I did enjoy Remo Williams…err…Fred Ward, for his little screen time. If ever given the chance to meet him, I would let him know that I have always enjoyed his tough guy roles. At 83 minutes, I wonder how much was left on the cutting room floor, that may have made this a more competent film? Maybe it was the studio, maybe it was Fleischer keeping things short and (as he saw it) sweet, I mean Zombieland was a tightly woven tale that was engaging from start to finish at 88 minutes. But this 83 minutes, while nearly short enough to play out as scripted television, drags on like War and Peace (no offense, Mr. Tolstoy). and I find it more interesting to learn that 30 MOL was also fueled by an assassination plot, in which the motivation for the robbery was to raise money for a hit. In both instances, the end goal is to the hit is to kill a parental figure, so that an inheritance will be gained by an untimely death. I wonder how “vaguely familiar” the screenwriters actually were, given these stark parallels. I had hoped for more from Ruben Fleischer, but this is really only his sophomore effort, following the very successful Zombieland. There is much buzz around his in-production The Gangster Squad, including the star-studded cast, which features It-Girl, Emma Stone, Sean Penn, and Ryan Gosling, among others. Too bad, so sad, as they say. I hope to have some word from the much anticipated The Help very soon, as well as some word on Glee 3-D. Another Earth finally hit KC this week, so I plan on taking that in soon, as well. And the dark horse of the weekend may be Final Destination 5, playing in IMAX 3-D as well as 2-D theaters. It’s PG-13 and surprisingly teetering near a fresh rating on RT. If nothing else, FD5 does feature the adorable Emma Bell.